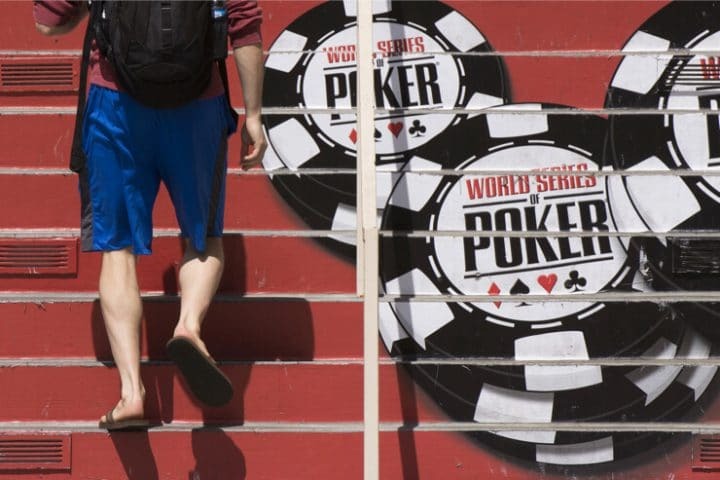 A poker player and the owner of the World Series of Poker have reached a settlement in a case involving the player’s ejection from the 2017 $10,000 buy-in main event in Las Vegas. Joseph Stiers, a Maryland poker player who was near the top of the chip-count leaderboard on the third day of the prestigious tournament, was disqualified without refund after the WSOP and/or the Rio All-Suite Hotel and Casino that hosts the tournament became aware that he had been banned from Caesars casinos nationwide and thus was trespassing at the world’s premier live poker festival. According to Stiers, he was banned in 2015 for card counting at the blackjack tables at Horseshoe Casino Baltimore, a Caesars property. His casino ban was the subject of a 2015 Baltimore Sun article. Stiers defied the ban and was able to play at the WSOP in subsequent years after entering under a pseudonym that was a variation of his real name. He wasn’t caught until 2017. While ignoring the ban, Stiers finished 640th in the 2016 main event and won about $18,000. He entered the event as “Joseph Conorstiers,” a combination of his middle and last name. According to a Feb. 1 court filing, Stiers and Caesars are nearing a resolution to the litigation. “Good cause exists for the extension because the parties have reached a settlement and would like to continue the deadline for Defendants to respond to the Motion so that they can finalize the terms of the settlement,” read the two-page court document. The lawsuit was filed on June 8, 2018 in federal court in Nevada. Stiers was acting as his own attorney. Stiers told US Bets via email on Tuesday that he can’t comment on the terms of the settlement thanks to a confidentiality agreement. A spokesperson for the WSOP told US Bets that Stiers is still barred from Caesars properties, so it appears the settlement doesn’t involve a lifting of the trespass. The WSOP said it couldn’t comment on the litigation. Stiers alleged that Caesars had committed breach of contract, unjust enrichment, and false and misleading advertising. His lawsuit sought a refund of the main-event buyin, as well as the equity he claimed to have had at that stage of the event, which he pegged at $150,000. The winner of the event received $8,150,000. He also was seeking punitive damages. When Stiers was ejected, the starting field of 7,221 players hadn’t yet reached the money. At the end of the third day of the tournament, 1,084 players remained. So, Stiers had a very long way to go before reaching the final table of nine players and guaranteeing himself a seven-figure prize. Caesars’ legal team responded in a July 2018 court filing, saying that Stiers’ “damages, if any, are speculative, hypothetical, unsupported by any reasonable methodology, and are not cognizable as a matter of law.” Lawyers also said that there was no contract with Stiers for his participation in a poker tournament. The casino’s initial response didn’t get into the weeds of the incident or Stiers’ ban from its properties nationwide, but asked that the case be dismissed with prejudice. Caesars was also asking the court for Stiers to cover its legal fees. The response from the poker community was mixed, but there was some sympathy for Stiers’ situation. After all, card counting using only your brainpower isn’t against the law. Casinos do have a right to refuse the action of a gambler for card counting. Casinos have been doing so for decades, so it was no surprise that Stiers received a ban. However, pop culture loves stories of advantage players winning against the house, so some of his peers had his back. But not everyone fully sympathized. The motivation behind Stiers’ lawsuit was that a ban from the WSOP had dealt a major blow to his poker career. The case should serve as another cautionary tale for advantage players.